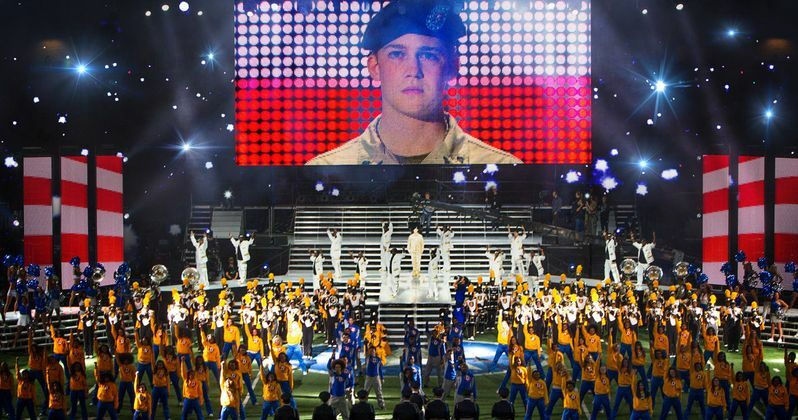 Last month, exhibitors and fans were given the first glimpse at Sony Pictures' upcoming drama Billy Lynn's Long Halftime Walk at the CinemaCon convention in Las Vegas, ahead of its November 11 release date. For those who weren't in attendance at the convention, the studio has released the first trailer for all to see, showcasing one soldier's harrowing journey, both at home and fighting abroad. The trailer gives us our first look at Joe Alwyn, who makes his feature film debut in this adaptation. Director Ang Lee brings his extraordinary vision to Billy Lynn's Long Halftime Walk, based on the widely-acclaimed, bestselling novel. The film is told from the point of view of 19-year-old private Billy Lynn (newcomer Joe Alwyn) who, along with his fellow soldiers in Bravo Squad, becomes a hero after a harrowing Iraq battle and is brought home temporarily for a victory tour. Through flashbacks, culminating at the spectacular halftime show of the Thanksgiving Day football game, the film reveals what really happened to the squad - contrasting the realities of the war with America's perceptions. The trailer debuted earlier today on the Sony Pictures YouTube page. The young actor is surrounded by an all-star supporting cast including Kristen Stewart, Chris Tucker, Garrett Hedlund, Vin Diesel and Steve Martin. Ang Lee used new technology, shooting at an ultra-high frame rate for the first time in film history, to create an immersive digital experience helping him dramatize war in a way never seen before. The trailer is set to an orchestral version of David Bowie's classic song Heroes, which takes you to the front lines of the human spirit. Ang Lee directs Billy Lynn's Long Halftime Walk from a screenplay by Jean-Christophe Castelli, adapted from Ben Fountain's critically-acclaimed novel of the same name. Marc Platt produces alongside Stephen Cornwell, Rhodri Thomas and Simon Cornwell. It's possible that this harrowing war drama could be an early front runner in the awards season race, but we'll have to wait and see how audiences and critics alike respond to this movie. Billy Lynn's Long Halftime Walk will hit theaters on November 11, going up against Universal's comedy Almost Christmas and EuropaCorp's thriller Shut In. The drama will be sandwiched between two highly-anticipated releases though, Marvel's Doctor Strange on November 4 and Warner Bros.' Fantastic Beasts and Where to Find Them on November 18. In addition to the trailer, we also have the first photo from Billy Lynn's Long Halftime Walk, which you can check out below.